Apart from love and care – pet food and water are two essentials in a dog’s life. It is up to every responsible dog owner to choose the products to hold these fundamentals, but how do you decide on the best dog bowls for your furry friend? Do you go with a set of average stainless steel dog bowls, an elevated set for a dog with neck pain, do you decide to try something new like an anti-slide bowl for that over-enthusiastic puppy or perhaps a more modern approach like a water fountain? Most dogs use only one set of dog bowls for several years, so why not invest some time and effort in finding the perfect one for your dog? Finding the best dog bowls does not have to be difficult nor boring, and it all comes down to what your dog needs and what you are willing and able to provide. The first step is learning about all the options available on the market, which tends to be quite a few. This article aims to make the process easier by testing and comparing some of the most popular dog bowls to buy on Amazon. Let’s dig in and have a thorough look at some of the dog bowl top picks for pet parents worldwide. There is something out there for everyone – it’s just a question of finding it! We think you might like: Best Automatic Dog Feeders. 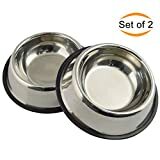 A great set of stainless steel bowls for dogs that have a hard time keeping food and water inside the bowl, or that tend to tip it over. 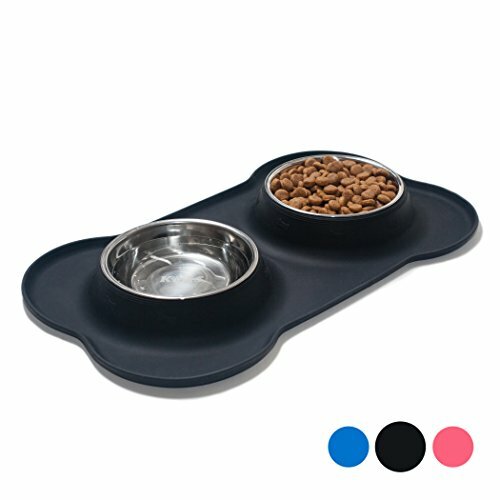 The large silicone platform prevents the pet bowls from sliding around across the floor; it stays in place and catches any food- or water spill. 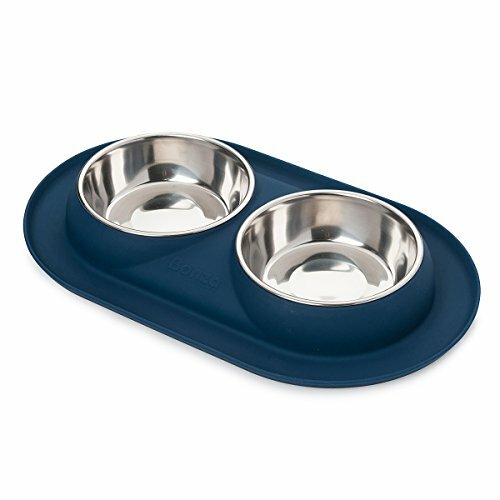 These big dog bowls can be used for two dogs to eat together, or as one pet dish for food and one water dish. As an extra plus, the URPOWER Dog Bowls are available in two different presentations! Get the bone shaped tray, or the one with a tray shaped like erect dog-ears! Both pet bowls and silicone platform clean easily – wipe the station off and it is good to go! 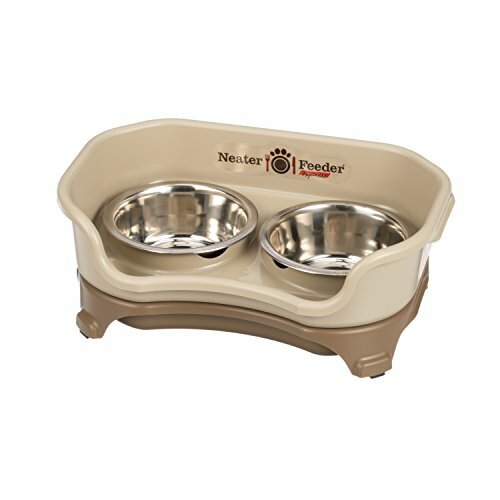 It is also conveniently dishwasher safe, making this feeding station a good option for a hassle-free feeding routine. Why We Liked It – It stays in place thanks to the silicone tray, which is large enough to catch spilled pet food and water even with the messiest of eaters. This colorful dual raised dog bowl will add an instant splash of life to any pet inhabited home. 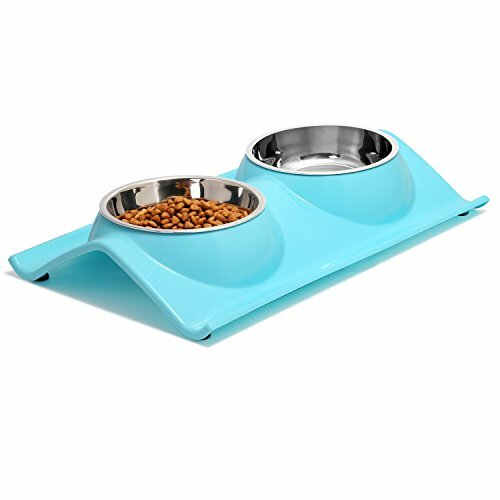 It comes in tea green, sky blue and rose red, allowing for it to be not only a functional pet feeding station but also a subtle statement of style. The stainless steel dog bowls hold up to 11 oz., making them best suited as food or dog water bowls for small dogs, or as temporary dog bowls to buy for puppies. The elevated pet feeder can be removed from the resin structure, for easy cleaning and refill. Both pet bowls and platform is dishwasher safe. This elevated pet feeder isn’t just stylish, but also practical. It is designed to catch any food or water that end up outside the bowl, to suit even the messiest of eaters! Thanks to its slightly elevated design, the UPSKY Double Dog Bowl is considered among the best bowls for dogs with neck- or back pain, older dogs, or as a method for preventing these types of health issues. Why We Liked It – It stands out among similar designs due to its fun colors, making it not only practical but also a nice addition to just about any room in the house. Similar to the URPOWER Dog Bowls in both function and design, this feeding station comes in two sizes – large, medium and small – making it an option not only for the dog owner on the hunt for large breed dog bowls but also those with smaller fur friends. The silicone base is large enough to catch that mess which feeding time often leaves behind, saving a busy dog lover from having to mop the floor several times a day. It rinses off safely in the water, and the heavy-duty dog bowls can be washed on the top shelf in the dishwasher for a deeper clean. 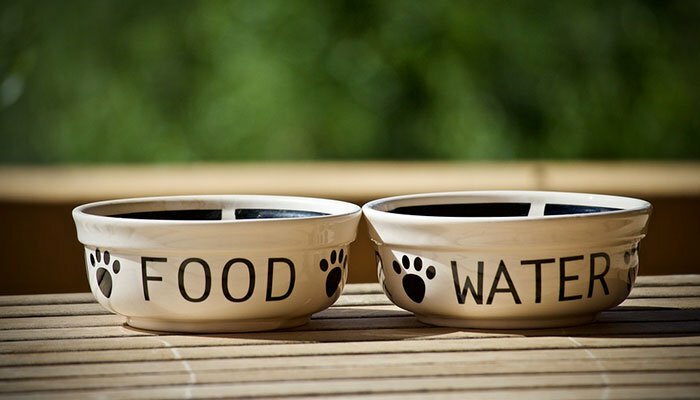 As the name indicates, these stainless steel dog bowls are a great option for your forever friends, regardless of their size, breed or level of messiness when they eat. 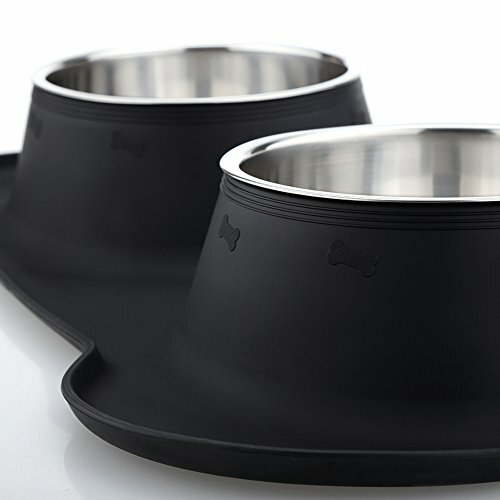 Why We Liked It – Comes in sizes that make them excellent dog bowls for large dogs, as well as an outstanding option for the absolute smallest. It is nice to see a product, which is available for all dogs. For those who share their homes with petite dogs like Chihuahuas and Yorkies these bowls are perfect to hold Chihuahua dog food, or ideal for Shih Tzu food – this charming set of pet bowls might be just the right choice. Designed for the smallest of dog breeds, these stainless-steel bowls are mounted on a cleverly constructed base, which can be taken apart for easy cleaning. It is dishwasher safe, prevents food and water from ending up on walls and on the floor, and it stays in place thanks to its rubber feet. The Neater Feeder Express comes in a bigger size as well, meant to fit medium to big dogs, but does not come in extra-large. It might not be the best dog water bowl for large dogs, but for a miniature dog, it is a dream come true. The slight elevation of this feeding station helps prevent digestive issues, something that is known to affect many small breed dogs. Why We Liked It – While many functional dog products are designed for large dogs, leaving the small pups with whatever is cute and adorable looking – this is a feeding station with a function, designed especially for the smallest dog breeds! Looking for a new bowl for your Yorkie? This is the one! Team it up with the best food for yorkshire terriers. Many dogs will throw themselves at a bowl of kibble the second they see it and gobble it all down as if they haven’t been fed in weeks. This can cause vomiting, digestive issues, or worse – bloat! Bloat in dogs is a life-threatening condition, which a dog parent will want to avoid at any cost. Mr. Peanut’s Interactive Slow Feeder dog bowls are designed to encourage a slower pace when eating and to make mealtime more challenging as well as a lot more fun. The dog gets to work for his dry- or soft food, eating around the centerpiece in this non-toxic and shatterproof stainless steel dog bowl. This dog feeder triggers their natural hunting instinct, possibly making these the best dog food bowls for dogs that love a fun challenge. 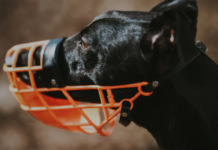 The slow anti-gulping dog bowl is kept in place by a silicone rubber ring around the bottom, which can be removed for a thorough and easy clean. This dog feeder also works excellently as water station for dogs all sizes. 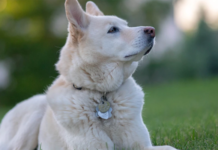 Why We Liked It – We know that dogs thrive when they get to use their brain and work with problem-solving, so it is not hard to love this slow feeder, which incorporates brain games in the everyday eating routine. Interactive dog bowls are here to stay! Did you know you can also slow your dog down with puzzle toys and bowls? For those who want a feeding station with a simple yet functional design – this could be the one! They are not the best dog bowls for large dogs as they only come in one size, but for dog owners looking for a sturdy set of stainless steel dog bowls for their smaller canine friends, the Bonza Double Pet Feeding Station makes for a reliable option. The silicone base keeps it from being pushed around, and any spilled water or pet food ends up in the tray rather than on the floor. The tray itself is slightly smaller than that of other similar feeding stations; such as the Friends Forever Stainless Steel product, which comes in handy when it needs to be accommodated in a smaller space. Due to its size, simplistic design, spill-preventive silicone tray and affordable price, these could arguably be some of the best dog bowls for puppies currently on the market. 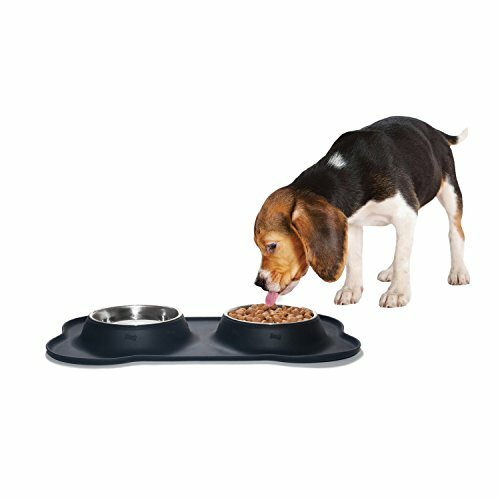 Why We Liked It – While similar to a lot of other dog products, the Bonza model has a tray which is slightly smaller than that of other manufacturers, which we think is great for those who don’t have a lot of space for their dog feeding station. The best pet bowls for a furry family member on the go! The COMSUN Collapsible Travel Dog Bowl is exactly what the name indicates – a bowl, which collapses and folds up, for easy transport and accessibility. The COMSUN Collapsible Travel Dog Bowls come in a variety of colors and each bowl is sold with a clip, which can be attached to a belt, the dog’s retractable leash, a stroller or anything which allows you to bring it with you wherever you go. 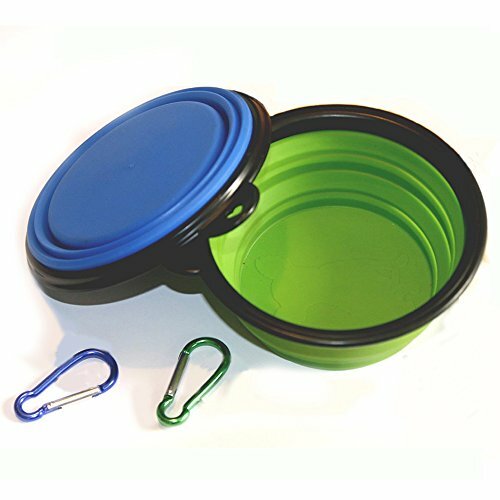 Bring these collapsible pet bowls for a hike, in the car, for a day at the dog beach or use it at home to save space – the possibilities are endless with this cheap little lifesaver. It is made of durable silicone, making it possible to rinse out or pop in the dishwasher, and it is by far – especially considering its accessible price – the most practical and best dog water bowl for the active dog and family. 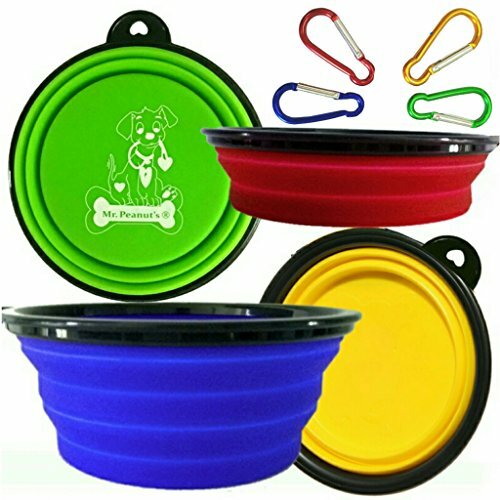 These collapsible travel bowls are not large dog bowls but can be used for dogs all sizes as a portable food and water container. Why We Liked It – It is incredibly handy to be able to give your dog some water during a walk on a warm day or when out on an adventure somewhere. These collapsible pet bowls do not take up any space at all when collapsed – it is easy to bring with you wherever you go! This pet bowl gets extra plus points for the very affordable price. Couple this with some of the greatest cheap dog foods on the market. Just like many other pet brands, this manufacturer has discovered what it is that pet parents truly need – a less messy way of feeding their dogs. 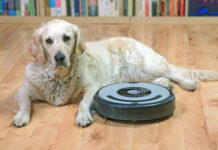 An enthusiastic eater can easily get at least half their kibble and water on the floor instead of in their mouths, something which calls for moping and other time-consuming cleaning routines for pet owners all over the world. The Internet’s Best Bone Dog Bowl puts an end to this with its clever silicone base, which keeps the stainless steel dog bowls in place, preventing them from tipping over and sliding around. Should water or food despite this end up outside the pet bowls – the tray will catch it and keep the floor spill-free. A good option for those looking for the best puppy bowls. The pet bowls can easily be removed from the silicone platform and stuck in the dishwasher for a quick and thorough clean. The large dog food bowls you can buy on Amazon hold up to 32 ounces. 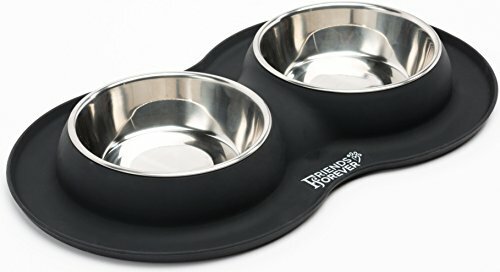 Why We Liked It – This two-in-one dog bowl can be used to feed two dogs together, or as a mess-free pet food and water station for anything from a puppy to an adult dog! You get a lot for your money, which is important when you shop for your loving pets. 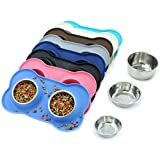 These collapsible bowls are sold in sets of three, four or five, hold 1.5 cups (12 ounces) of water or pet food and are good dog dishes to buy for the pet families that like to be out and about. It attaches easily to just about anything with the included clip, making it perfect for runners or hikers who want to be able to offer their dogs a well needed water break, or a quick meal. A plus when it comes to Mr. Peanut’s Collapsible bowls is that the company donates a percentage of their profits to animal welfare, shelters and rescue organizations, so by making a purchase you are indirectly helping animals in need. The product is made of non-toxic silicone materials and safe for both pets and humans to use, which makes it a handy item to keep in the car, in your bag or over at your mother in law’s house for future dog visits. It takes up very little space when collapsed; yet it stands steadily when used correctly. 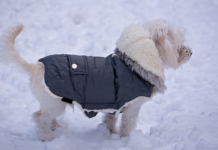 Why We Liked It – It is great to see a product that isn’t only practical and cleverly constructed, but that also gives back and pays it forward, by donating to animals in need. 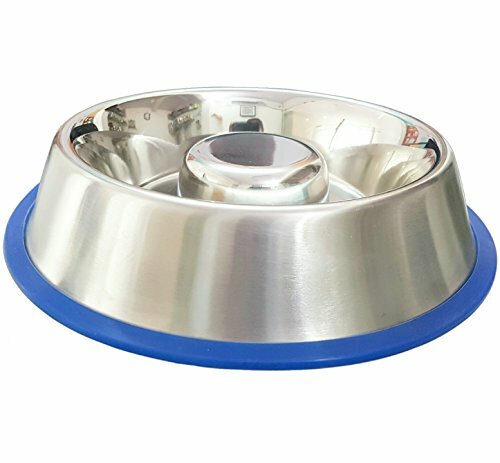 An excellent option for those with small breed dogs or cats, as these stainless steel dog bowls only come in one size. Would they make the best dog bowls for Labradors and other large breed dogs? No, but it is an ideal feeding station for smaller family members. Choose between traditional and classy black, vibrant pink or relaxing sky blue, depending on what fits your fur baby’s (and your) personality. The bone-shaped base is made with eco-friendly BPA free silicone and each bowl holds 12 oz. of food or liquid. These dog dishes won’t move an inch while your pup eats and drinks, thanks to it’s no slip-, slide- or skid materials, saving you as a busy pet parent from having to run after your dog while he pushes his pet food bowl around the room. The tray is designed to prevent any spilling onto the floor, and can be rinsed off, wiped off or popped in the dishwasher once mealtime is over. Why We Liked It – The product is especially made for small dogs, with steel bowls just the right size and height to provide the smallest family members with a hassle-free eating experience. Every pet owner wants what is best for his or her dog, and before acquiring a new set of dog bowls it is important to pause and think about what it is that your dog needs. The next step is to learn what the market offers, compare options and finally picking a product that fits your requirements. It is important to look for a high-quality product at an affordable price, as this is something which will be used daily by a hungry animal. 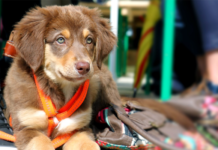 You will want it to hold the quantity of pet food your dog eats, preferably stay in place and not skid around, and be easy to clean to avoid bacteria forming. Choosing a product based on materials is a surprisingly good idea. Plastic contains BPA, which is toxic to humans and pets, and while it might not directly affect your dog – there has been reports of discoloring on the nose of some dogs after using plastic dog bowls for an extended period of time, as well as dog acne. Worried about your dog on the inside? Check out our guide on hypoallergenic dog food. It is wise to avoid cheap plastic bowls and aim to buy those made of stainless steel, ceramic dog bowls or a large stoneware dog dish instead. Silicone is a non-toxic alternative to plastic, seen used more and more in the production of dog bowls and feeding stations. There are a lot of dogs that can benefit from eating from an elevated bowl, or a bowl placed above floor level. It can greatly reduce the risk of digestive issues due to pet food entering the digestive tract from a more natural angle, and it something to consider both for large dogs and small companions. An elevated bowl also provides relief for (as well as prevents) neck pain and back problems in dogs, and especially an older dog might show an increased appetite when offered pet food from an elevated bowl. When shopping for big dog food bowls, it is important to read the product descriptions and make sure that the bowls are large enough to hold the amount of food your dog is fed at mealtime. Nobody has time to stand by and re-fill the bowls after half a meal, and a bowl that is too small is more likely to tip over and make a mess. They also need to be sturdy enough, especially if your large pup has a habit of chewing on things. For a small dog, the most important thing is that the bowl is low enough for him or her to eat comfortably without struggling to reach the kibble left at the bottom. Width isn’t necessarily essential, but height becomes important, or the dog runs the risk of tipping over and either falling into the bowl or spilling its content all over. 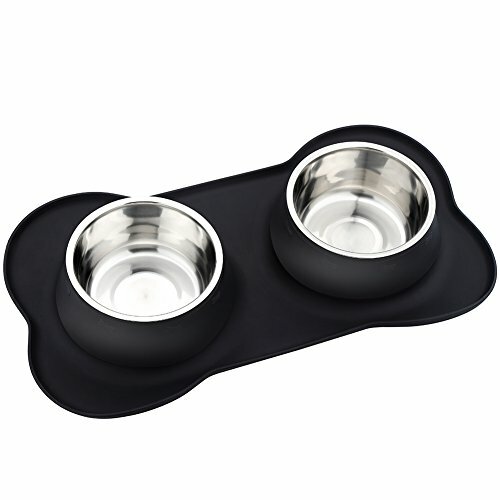 Non-skid bowls with a silicone bottom is an ideal option for rambunctious puppies eager to be fed. Puppies have little control of their bodies, making them prone to push bowls over or fall against them. A non-skid bowl won’t budge, and if choosing one with a tray it will also catch any food or water that would have otherwise spilled onto the floor. 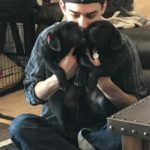 Is One Feeding Station Suitable for Multiple Dogs? 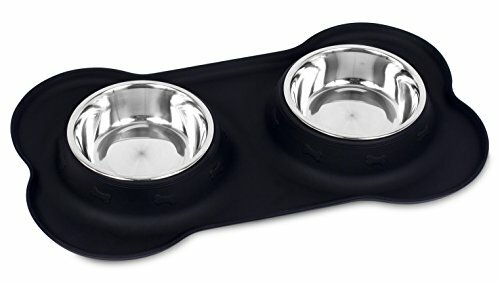 It is a possibility to use a dual bowl feeding station as food bowls for two different dogs, for them to eat together, rather than one bowl for food and one for water. However, the dogs would have to be of a similar size, or the food bowls won’t be size appropriate for the two of them. When shopping for dog bowls, the price isn’t necessarily an indication of quality. The best thing to do is to research different options, learn what would work best for your dog and make a decision based on that. It is also important to remember that dog bowls will eventually need to be replaced, and are unlikely to last a lifetime, but by picking a product which is made from durable materials and is easy to clean, they will last a lot longer than they would otherwise. 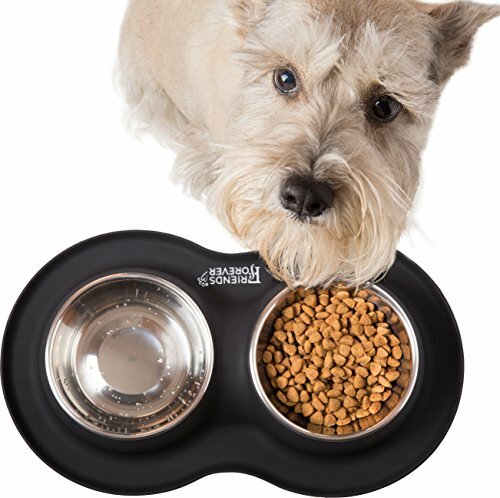 What Kind Of Bowls To Use For Dog With Cone? Most dogs are likely to end up in the dreaded cone of shame at some point in their lives; either due to a neuter or spay, to a broken toe nail or any other type of surgical procedure or injury, and with that comes the difficulty of eating and drinking. To make it as easy as possible on the dog; consider getting an elevated dog bowl that is small enough to fit within the cone, so that the dog can lean forward and eat and drink effortlessly also with the cone on. Finding the right bowl for your furry friend can seem like an easy task at first, but the more you read, the more you realize how many options there are out there. Don’t be alarmed, however, and take yourself the time to find the perfect option for your dog. Think about what you wish for the bowl to accomplish, look at similar dog products, compare prices and review, and make a decision. No dog is the same, just like no dog bowls are exactly the same, but the good news is that there is an ideal bowl for every pup out there! It is just a matter of finding it. Pay attention to user reviews. If you want to be sure of what you are getting, read what other buyers have thought of the product after receiving- and testing it. Dogs quickly learn to recognize their food bowl as the pet food provides the dog with nourishment; so whatever bowls or feeding station you choose for your pup – it is likely to become a source of genuine happiness and excitement. Choose wisely.